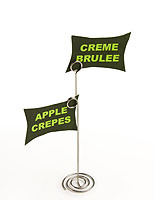 This memo holder is perfect for use in restaurants, retail stores, offices, hotels and office spaces. 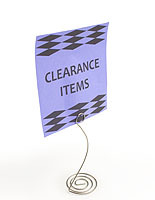 This metal sign, note clip can be used to hold advertisements, cards, photos and messages. 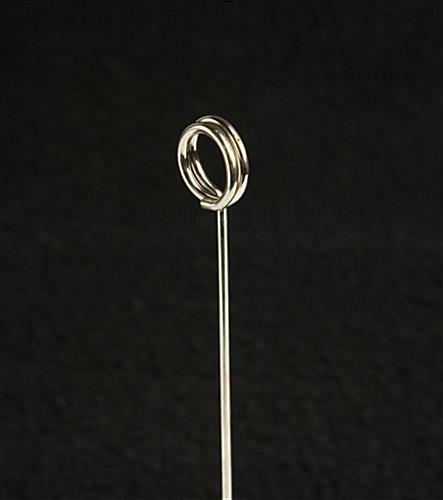 Constructed from durable wire with a spiral design, this memo holder can easily match any location. Each note clip is made from one solid piece of heavy gauge wire; making this an extremely durable stand. This memo holder, also known as a card clip, easily captures the attention of onlookers. 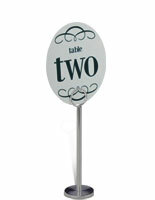 Use this metal clip stand at a wedding or business function to label each table with a number. 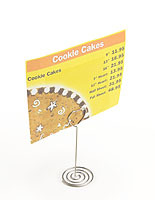 Standing at a height of 7", this memo holder makes it easy for customers to notice daily specials or new menu items. 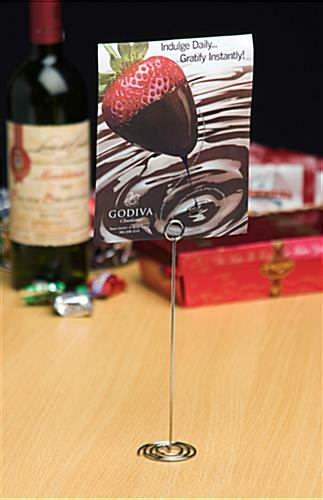 This silver place card display can also be used in a restaurant to designate reserved seating. This memo holder is a versatile note clip for personal or advertising purposes. 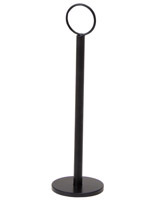 Place this wire stand on a desk to post daily reminders or as an alternate means of displaying family photos. This card clip, memo holder can also be used to display advertisements on both sides. 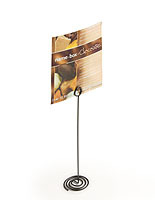 Each note stand, such as a sign display and place card clip, is elegantly designed. 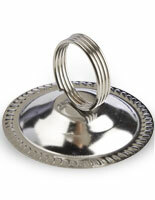 We offer this memo holder in many designs and colors, in addition to the one seen here. Order this note clip in bulk quantities to take advantage of the low prices. 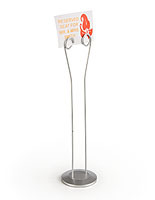 Use this memo holder to promote, advertise or display any number of items. Please Note: When ordering, 1 unit = 50 memo holders. The displays were cute but wouldn't stand up on their own. I was decorating for a bingo party and merely placed a flimsy bingo card in the holder and unless I taped it to the table, down she went. Base could have be bigger to support whatever weight of a card/sign you wanted to display. Hi Jodie! We're so sorry these were a hassle at your bingo party. One of our customer care specialists will be reaching out to you to assist. Thanks for making us aware of this! These do not stand up! 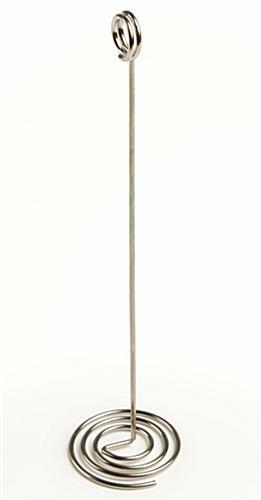 DO NOT ORDER THESE place card holders, they don't stand up! With a 3x5 cardstock number, they fell right over. Very disappointed that display company sells such an inferior product. Unless you want your table numbers lying on the table, do not order these! We apologize about the issue with your product, Jamie. A representative from our customer care team will be contacting you shortly. Accurate and ground shipping was faster than I expected. Thank you!